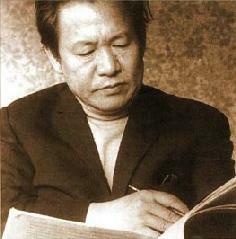 Yun, Isang, important Korean composer; b. Tong Young, Sept. 17, 1917. He studied Western music in Korea (1935-37) and in Japan (1941-43). After the end of the war, he taught music in South Korean schools; in 1956 went to Berlin, where he took lessons in composition with Boris Blacher and Josef Rufer at the Berlin Musikhochschule. He settled permanently in Berlin, where he produced several successful theatrical works, marked by a fine expressionistic and coloristic quality, and written in an idiom of euphonious dissonance. 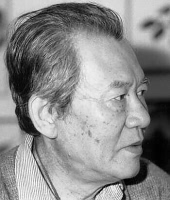 His career was dramatically interrupted when on June 17, 1967, he and his wife were brutally abducted from West Berlin by the secret police agents of South Korea, and forced to board a plane for Seoul, where they were brought to trial for sedition; he was sentenced to life imprisonment; his wife was given three years in jail. This act of lawlessness perpetrated on the territory of another country prompted an indignant protest by the government of West Germany, which threatened to cut off its substantial economic aid to South Korea; twenty-three celebrated musicians, including Igor Stravinsky, issued a vigorous letter of protest. As a result of this moral and material pressure, South Korea released Yun and his wife after nearly two years of detention, and they returned to Germany. In 1970 he was appointed a professor at the Hochschule für Musik in Berlin. Isang Yun died on November 3, 1995 in Berlin, and was interred in a grave of honour provided by the City Senate. He was a member of the Hamburg and Berlin Academies of the Arts and of the European Academy of the Arts and Sciences in Salzburg, an honorary member of the International Society of Contemporary Music. He also held an honorary doctorate from the University of Tübingen, and was the recipient of the Goethe Medal of the Goethe Institute in Munich and the Distinguished Service Cross of the Order of Merit of the Federal Republic of Germany. What follows is the transcript of a telephone conversation with composer Isang Yun. It took place in July of 1987 while he was at the Cabrillo Festival in California. Not withstanding the importance of speaking with this musician, the circumstances of the chat itself are of interest. It all came together on a good day for everyone concerned. I was in my home in Chicago, and Yun was at the home of composer Lou Harrison. [To read my interview with Lou Harrison, click here.] The translator, to whom I am very grateful, was the conductor Dennis Russell Davies, whom I had also met and interviewed previously. Here is what was said that evening . . . . .
Bruce Duffie: Let me start out with an easy question: Where is music going today? Isang Yun: I don't think anyone can really answer this question, myself included. I can say for myself that my music is becoming more understandable, and I find a quality of human sympathy is becoming more prevalent in it. BD: Is this something being added now that was missing earlier, or is it an outgrowth of the way your music has been going all these years? IY: It's part of a natural process, and I've just noticed it through observation. This is a process that started about ten yeas ago and I think it will be at least another ten years before it is fully developed. BD: Did something specific happen at that point ten years ago to make this change? IY: My experience of the personal side and political area in Korea happened twenty years ago, and it took ten years for me to be able to translate these experiences into my music. I think today our world very badly needs music that brings us closer together, particularly because there are so many grave problems that people everywhere are having to deal with. In order to be able to articulate these problems in art, we need a great deal of musical understanding. BD: Should music be political in and of itself? IY: That is exactly what I do not mean. Music is the expression of an inner truth, and this inner truth is naturally a mirror of today's events. It's always been that way. In earlier times, landscapes or love was the theme in works of art. Today the problems have become much different and much more serious. One example is the uncertainty of the future of mankind; this is in question. The anxieties over our future and the destruction of peace and the dangers of war, and the atomic dangers. This idea is very important. It is not the theme of music, but the musical expressions that I use naturally and automatically which reflect these influences. BD: Should the audience be aware of these influences and/or the process? IY: Whatever the composer takes for his subject is privately his, and the listeners don't have to know it. But the circumstances of the creation contain such elements. In other words, if these truths are part of the elements, part of the process of composition, eventually the listener will be affected directly by it. IY: A composer is not in the position to dictate how a person listens to music. The public has total freedom and the listener is entirely free as to how he wishes to approach a piece of music. Every group of listeners is different one from another, and the situation that the listener finds himself in is different from that of another listener. But the important thing is that this music somehow moves him deeply one way or another. BD: Does that mean that the same piece of music will be different at different times of performance? IY: Yes, it could be. But I feel that if the music really possesses these elements that make up a truth as I see it, the public cannot help but be moved. BD: If you cannot have any expectations of the public, what are your hopes for them? IY: I hope there will be a contact, a connection, and through this contact my music will mean something to the listener. BD: Assuming that mankind survives, are you optimistic about the future of music? IY: Yes, I'm very optimistic. That's why I compose! I haven't given up hope by any means. In spite of the fact that very often I deal with very negative or tragic themes, I never personally find myself in a situation of depression or uncertainty. At the end of every piece, no matter how tragic the theme or the events around it, I always leave the possibility of hope in that piece. BD: When you're writing a piece, how do you know when it's finished? IY: My music doesn't have a beginning nor an end. You could combine elements from one piece into another piece very well. This is a Taoist philosophy. Music flows in the cosmos, and I have an antenna which is able to cut out a piece of the stream. The part which I've cut out is organized and formed through my own thought and body processes, and I commit it to paper. That's why my music is always continuous - like the clouds that are always the same but are never alike one to another. BD: When you're writing, are you in control of the music, or is the music in control of you? IY: My deep-lying inner feelings dictate to me. I'm not sure that's myself, but I'm fortunate to have a Godly gift speaking through me. So I can sound very Asiatic, or very Buddhistic, or very religious, or very philosophic. But that's how I think. That's why I don't consider what I'm doing "composing." I'm writing down that which my deepest feelings and instincts tell me to write. BD: Then you're perhaps the ideal person to ask this question: How is the Eastern public different from the Western public? IY: As far as the capabilities and capacities to listen, everyone is the same. The differences lie in the areas of experience. Basically you can describe very clearly the differences between European and Asian music, for example, but that's the result of the different experiences the people have had through their history. But the ability of the audiences to listen is the same. BD: Are you making a conscious effort to combine both the Eastern and Western spirits in your music? IY: No, that would be too artificial. The inner truth is, in actuality, a music of the cosmos. Realistically seen, I've had two experiences, and I know the practice of both Asian music and European. I am equally at home in both fields. I'm a man living today, and within me is the Asia of the past combined with the Europe of today. My purpose is not an artificial connection, but I'm naturally convinced of the unity of these two elements. For that reason it's impossible to categorize my music as either European or Asian. I am exactly in the middle. That's my world and my independent entity. BD: We've been talking about East and West. Are there more elements in this large musical cosmos? IY: In the cosmos, there is neither East nor West! BD: Have you basically been pleased with the performances and recordings of your music over the years? IY: Looking at it realistically, they're the best I could have hoped for. To be completely honest, as a composer one cannot be 100% happy. As a composer I would find it impossible to be completely content with my own music or with the interpretation of the music. But I'm a very realistic person and know that I have several unusual requirements in my writing which, especially for European-trained orchestras, are new and difficult. When one looks at it from this standpoint, I'm very happy. BD: You've done some teaching of composition? IY: Yes, I've taught musical composition for 15 years in Berlin. IY: The idea of receiving thoughts through your antenna is not a very easy thing to teach. The student must be quite developed in the soul and spirit. In Europe or America, one says, "to be inspired." The second thing is also difficult, and that is to organize and write down these ideas or inspiration that one received through the antenna. That's what we call compositional technique, and to get that across you need a very experienced teacher. BD: Have we, perhaps, got too many young composers coming along today? IY: There are very many, and unfortunately they have a very difficult time. The human possibilities for enjoying and listening to music have become so many-sided and so variable, and the young composer has to find a way to move the human heart. It is as difficult as getting a thread through a needle. BD: Tell me the particular joys and sorrows of writing for the human voice. IY: I've written very few vocal pieces, but there are four operas. My Fifth Symphony has a singing line all the way through. The premiere will be in Berlin in September, and Fischer-Dieskau will sing. BD: Do you feel that opera is still a viable art form? IY: I would say that opera can still be meaningful, but the future is not very optimistic. BD: Will opera change or will it die? IY: As long as the trend continues to not give new operas a chance and not to promote the creation of new operas, that means that essentially the opera will die. BD: Can anything be done to avert this outcome? IY: What has to happen is that operas must be composed as a teamwork between the composer, the stage director, and the management of the opera house. And the operas that are composed must be attractive to the public, to a young public. But it has to be completely different than it has been up to this point. The drama and the vocal line must not be destroyed through the orchestral playing! Up to now, the orchestral sound has dominated the operas too much, and the pieces themselves have been much too complicated, much too intellectual. I'm speaking, of course, for contemporary works, and that is why the public has been alienated. But the music cannot just be cheapened or just done for effect. It must, at the same time, have a very high quality and the possibility of winning a very broad public. How to do it is the question. I think the way would be this teamwork I mentioned, and intelligent commissions from the opera houses. BD: Is this happening, or do you think it will happen? IY: I'm very pessimistic about that because an opera house is basically a subsidized enterprise, and the people who subsidize these opera houses think only of the box office. They're not in a position to think about the future. BD: Do you feel opera works well on television, and might this help the situation? IY: That might be a big possibility, but then you must realize that basically you're dealing with a very simple public. But dealing with a relatively inexperienced audience might have a very big future. I think that this is something that the television networks should definitely undertake. BD: How do you feel about opera in translation? IY: I think that generally translations are good. BD: Have you seen this new gimmick of supertitles in the theater? IY: I've never seen it, but many things should be tried in order to rescue opera! BD: Are most of the pieces you write on commission, or are some just things you have to get down on paper? IY: I write everything on commission. BD: Then how do you decide which ones to accept and which ones to turn aside? IY: In the main I accept them all. I'm a very positive and nice person, and I like to do it. (laughter) That's why I've written a great number of pieces. BD: Do you work on more than one at a time? IY: I could never do that. I currently have several small orchestra pieces to write, but I would like to stop composing right now. However I don't think I could do that. BD: What would you do if you didn't compose? IY: I would like to just think the music. I'd like to just fantasize and imagine the music and not have to compose it. My health isn't the best and that's one reason I'm going to have to slow down a little bit. I can probably manage to do that, but I don't see myself being able to stop. BD: As you approach your 70th birthday, what is the most surprising or pleasing thing you've noticed about music? IY: It's been very difficult work, very hard work, but I've never regretted the fact that I am a composer. 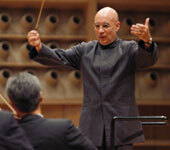 BD: What advice do you have for someone who wants to conduct modern music? IY: I wouldn't presume to give advice to a conductor in that situation. The conductor would know exactly what to do. BD: Do you feel that conductors know what they're doing? BD: Do conductors or performers ever find things in your music that you didn't know you'd put there? IY: I don't think so because I always know exactly what I'm composing. I've never tried out ideas with an instrument, but always with my imagination. I've never made sketches, but rather always composed each piece from the beginning to the end. It's never changed or corrected. I've always been able to hear in my ear that which I'm writing. BD: Are you conscious of the playing time of the piece even as you're working on it? IY: Thank you. That makes me very happy. I still question today whether I really am a composer. BD: Do you feel that history will be the final judge? Bruce Duffie was and announcer/producer with WNIB, Classical 97 in Chicago from 1975-2001, and now continues his radio work with special programs of music and interview on WNUR-FM, and Contemporary Classical Internet Radio. His interviews also continue to appear in various magazines and journals. For full details, plus links to other interviews and photos, visit his website.